We are finally maintaining only one residence. Let me tell you, as convenient as it was to have a place to stay in both of the cities that my husband works in for the past six months, two homes is hard. And expensive. Especially with only one home’s worth of stuff. During that time, we of course also had two different utility bills, which was quite interesting. Each place was serviced by a different utility company, MG&E, and Alliant, but the offerings as far as renewable energy went were pretty much the same. Our apartment was about 500 square feet, and had electric baseboard heating. And let me tell you, our energy costs there were much higher than for our 1000 square foot house that has a gas furnace. It was surprising to me just how expensive and inefficient electric heating is. I’ll get more into that in a future post. So now we have one home. One energy bill. And now the burden of maintenance is on us rather than a landlord. Time to get busy. Again, nothing special in terms of upgrades for energy efficiency this month. We’re spending most of our time and energy this spring and summer on our yard and garden and all that outside stuff that it sure is nice to have warm weather to complete. But it’s important to have months where we don’t make any big changes and just live in our home so we can get a sense of our baseline energy use. Over 29 days we used 390 KWH. Which comes out to an average 13.4 KWH/day. Compared to the last billing period average of 15.5 KWH/day, we dropped a bit, due to spending a week or so in our apartment getting ready to move out. We are part of the Alliant Energy Second Nature renewable energy program, at the 100% level. (In this program you can choose the amount of your energy use that you want to be matched in renewables, and we chose 100%.) The cost of our renewable energy increased on June 1st, So the cost of our electricity is $0.13 per KWH for the 18 days of May on our bill, and $0.14 per KWH for the 11 days of June, for a total of $52.68. This month we used 0 Therms of natural gas heat energy. Which averages out to 0.0 Therms/day. However we did still have a small charge to keep our gas on this month, and probably also to pay for meter readers and what not. Degree days this month compared to last month: 148 vs. 347. The natural gas market fluctuates in Wisconsin, so there is not an easy dollar per Therm number to give you, but during this billing period we paid $8.93 for our gas use. Electricity used this month last year: 758 KWH. I imagine this number is going to drop pretty significantly in coming months, because we’re almost to the point where the previous owners of the house listed it for sale, and during that time they were already living in a different residence. Gas used this month last year: 1 Therm. Average temperature this month: 63° F. This month last year: 54° F.
Degree Days this month: 148 vs this month last year: 108. Degree days are the number of degrees below 65° F in one day, all added together for the total 29 days of the billing period. Want to see previous months of the Energy Efficiency Project? Here is Month 1, Month 2, Month 3, Month 4, and Month 5. This entry was posted in energy, house and tagged energy efficiency project, house, spring on July 16, 2015 by clare-admin. While we celebrate our Independence this weekend, let’s also celebrate some of the wins we’ve made in America and around the world in the past year in terms of renewable energy growth. 1. We’ve reached 1% of worldwide energy generation through solar power! Ok, so 1% sounds pretty small, but nearly a quarter of that was installed just within the last year, and the prices on solar generation continue to fall, meaning that soon it will not only be the earth friendly way to get your electricity, but it will also be the wallet friendly way. This first 1% is hard won, requiring decades of work by scientists and engineers to bring the technology forward and the price down. China, Japan, and the U.S. are leading the way on solar power installation. You can read more about this achievement here. 2. Dirty, Old coal plants are retiring across the U.S. In the past year, 7% of coal plants have been retired. These retired plants are the oldest of the currently existing coal plants and dirtiest methods we currently have of generating electricity, so shutting them down is a good step to reducing the dangerous particulates they exhaust – like mercury, from the air. The old coal plants are retiring for a couple reasons – they are too dirty to meet current regulations, and they are being priced out by the plummeting costs of producing electricity using renewables. You can read more about the shutting down of coal plants here. One of the biggest challenges with the move to renewables such as wind and solar, is that the amount of energy that they generate fluctuates. On a windy day, wind turbines can be constantly generating electricity, but if the wind dies down – people will still want to use their computers, refrigerator, and air conditioning regardless. Same with solar power, the power generation fluctuates not only with day and night, but with cloud levels and season. A sunny day in Arizona can produce more energy collected by solar panels than all the people of Arizona can use in a day, but at night, that all goes away. So battery capacity is key for capturing and saving all that energy until it is needed. This means that projects like the Tesla Gigafactory will be key in meeting our energy storage needs. You can read more about the Tesla Gigafactory here. 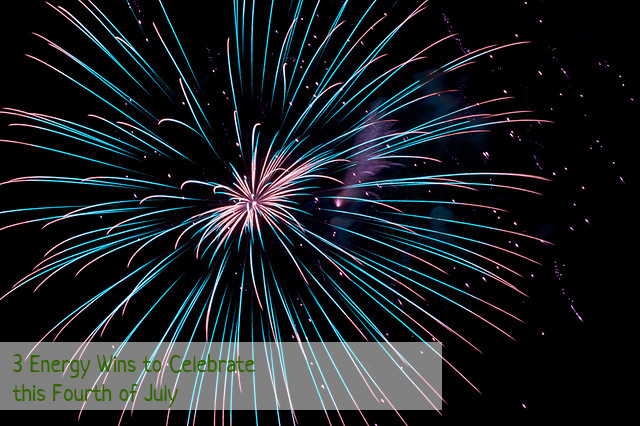 So there you have it, while you are celebrating independence this weekend, go ahead and light a sparkler or two for these 3 energy wins to celebrate this year. And you can follow us on facebook, pinterest, or instagram! This entry was posted in energy and tagged batteries, coal power, holidays, solar power on July 3, 2015 by clare-admin. I’m back after a couple week hiatus due to finally finishing up our move from apartment to house, some traveling, and some adjusting to a new schedule. One of the troubles with having a significant other who is in residency is the constantly shifting schedules. 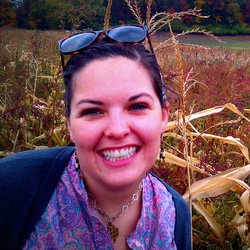 Throw in the mix a toddler that thrives on a schedule, and it means our life sometimes goes topsy-turvy as we adjust. And now we’re well past due for giving you an energy efficiency project update. So, here goes. We had a mid-April cold snap that caused us to turn the heat back on for a week or so. And as I mentioned above, we completed our move during this billing period, so we have a few more energy users in our home these days – a television and XBox, a lamp, etc. And lengthening days mean we’re using our lights less. Nothing special in terms of upgrades for energy efficiency this month. But it’s important to have months where we don’t make any big changes and just live in our home so we can get a sense of our baseline energy use. Over 29 days we used 451 KWH. Which comes out to an average 15.5 KWH/day. Compared to the last billing period average of 9.45 KWH/day, you can see the definite difference in energy use between basic maintenance mode, and everyday living mode. We are part of the Alliant Energy Second Nature renewable energy program, at the 100% level. (In this program you can choose the amount of your energy use that you want to be matched in renewables, and we chose 100%.) So the cost of our electricity is $0.13 per KWH, for a total of $59.04. We also used 13 Therms of natural gas heat energy. Which averages out to 0.45 Therms/day. Huzzah for spring and only using our furnace for about a week during this month. Degree days this month compared to last month: 347 vs. 754. The natural gas market fluctuates in Wisconsin, so there is not an easy dollar per Therm number to give you, but during this billing period we paid $15.45 for our gas use. Gas used this month last year: 17 Therms. Average temperature this month: 53° F. This month last year: 51° F.
Degree Days this month: 347 vs this month last year: 466. Degree days are the number of degrees below 65° F in one day, all added together for the total 33 days of the billing period. 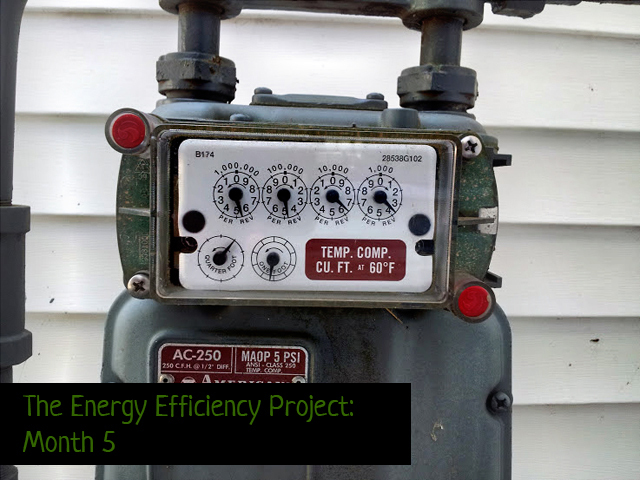 Want to see previous months of the Energy Efficiency Project? Here is Month 1, Month 2, Month 3, and Month 4. This entry was posted in energy, house and tagged energy efficiency project, furnace, lights, spring on June 12, 2015 by clare-admin. Turned off thermostat starting on April 1st! Made sure that all lights and other electricity users aside from the refrigerator were off while we were away. Over 33 days we used 312 KWH. Which comes out to an average of 9.45 KWH/day. Which is a small decrease from the last billing period average of 10.75 KWH/day. My guess is our decrease came from extended daylight hours, which meant less lightbulb use while we were in the house. We are part of the Alliant Energy Second Nature renewable energy program, at the 100% level. (In this program you can choose the amount of your energy use that you want to be matched in renewables, and we chose 100%.) So the cost of our electricity is $0.13 per KWH, for a total of $40.85. We also used 35 Therms of natural gas heat energy. Which averages out to 1.06 Therms/day. We only used the gas furnace for the first half of this billing month, and then of course had some gas use for the hot water heater. Also, we had a pretty warm start to our spring in these parts, so the degree days this month compared to last month: 754 vs. 1383. As you can see, the degree days this month is only a bit more than half of last month, which explains why we were able to turn off our furnace completely for half the month. The natural gas market fluctuates in Wisconsin, so there is not an easy dollar per Therm number to give you, but during this billing period we paid $32.24 for our gas use. Gas used this month last year: 41 Therms. Average temperature this month: 43° F. This month last year: 36° F.
Degree Days this month: 754 vs this month last year: 835. Degree days are the number of degrees below 65° F in one day, all added together for the total 33 days of the billing period. This entry was posted in energy, house and tagged energy efficiency project, furnace, house, lights, spring on May 8, 2015 by clare-admin. The last time we checked in on the topic of insulation and insulating a house to the point where it wouldn’t need a furnace was back in December. Sheesh. The cold has broke here in the northern great lakes region, and while there is still a chill in the air some days, we seem to be headed right into spring. The good news is, insulation is not just a winter topic. Good insulation in your home will help keep it comfortable all year long. And keep your energy bills down. And so we forge ahead with adding insulation for energy efficiency. Previously, I walked through the calculations to determine the payback period for adding insulation. Today let’s look at a couple of examples of how that might work our in practice. OK, take a deep breath. We’re about to do some math! For our first example, we’ll use the following situation: A house in Wisconsin is going to have its insulation upgrades. It currently has fiberglass batting with an R-value of 13, and will be upgraded to fiberglass batting with an R-value of 19. The cost of the new insulation is $0.41 per square foot. The house is heated by a natural gas furnace that is 85% efficient. The cost of natural gas in Wisconsin is $0.82 per therm, and 1 therm is equal to 100,000 Btu (British thermal units). The number of heating degree days for Wisconsin is 7499. We want to find the payback period for the new insulation. Wowza! That’s more time than I was expecting. So what are the key factors here that could cause this to payback period to go down? Well, first of all, with a little more looking, you might be able to find a better price on your insulation than a quick tour through the Home Depot website gave me. Also, natural gas in Wisconsin is pretty dang cheap right now, all things considered. But as more cities and states do things like ban fracking for natural gas, that cost could go up significantly, which would obviously bring the payback period down. Example 2: Sprayed Foam Insulation – How much can we get? What if instead of replacing all that R-13 fiberglass insulation with R-19 fiberglass insulation, we wanted to replace it with spray foam insulation? Spray foam insulation has an R-value per inch of foam thickness. You can increase the total R-value by spraying a thicker layer of foam. There are tons of options available as far as spray foam goes, but for the sake of this example, we will use this Dow Froth Pack as our insulation. This spray foam provides R-6 per inch of thickness, so 1 inch has R-6, 2 inches has R-12, 3 inches has R-18, so on and so forth. In this example, instead of calculating the payback period for the spray foam insulation, we’re going to see how thick of an insulation layer we can “afford” to apply, given the same payback period as the upgrade from R-13 to R-19 fiberglass. In other words, we are going to solve for Rf. Rf = 10.67, or about 1.75 inches thickness of the spray foam insulation. So, for the same payback period as with the fiberglass insulation, we’d actually be downgrading from R-13 to R-10.67 with the spray foam. If we wanted to increase to the equivalent R-value, our payback period with the spray foam would be nearly twice as long! But then what’s all the fuss about spray foam insulation? Why would anyone use it if the return on investment is apparently so low? Well, the R-value of the insulation isn’t telling you the whole story here. Remember the walls of your house are not just made out of batts of insulation. There is also the framing, the siding, the sheet rock, and all the other layers to consider. And those layers typically have small cracks and crevices where the heat can leak quite easily. One of the benefits of the spray foam insulation is that it fills in and seals all those leaky spots. So not only do you have the impact of the insulation layer, but you’ve increased the insulation abilities of all those other layers as well. Insulation can be one of those things were whole is greater than the sum of the parts. Onward, Energy Efficiency Warriors. Next time we visit this topic we’ll get to the big finale: Can you insulate a house enough such that you don’t need a furnace??? 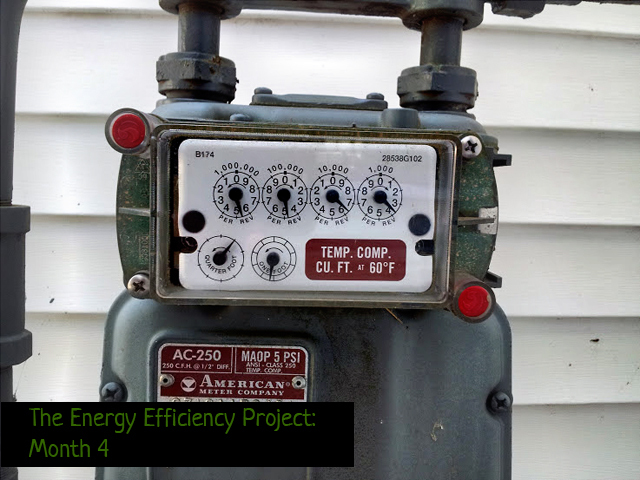 This entry was posted in building, energy, house and tagged efficiency, energy efficiency project, heating, insulation on April 16, 2015 by clare-admin.